In this undated photo, Theodore Roosevelt waves to a crowd. 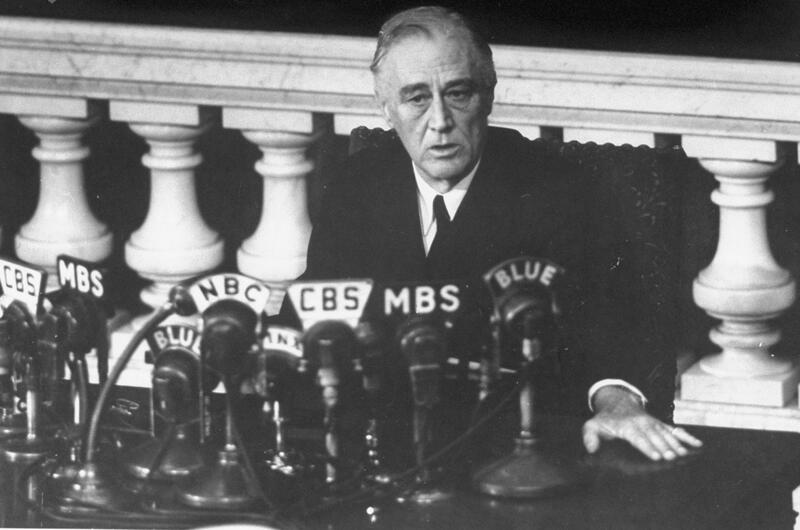 Shortly before his death, President Franklin D. Roosevelt reports to Congress in 1945 on the Yalta Summit Conference. 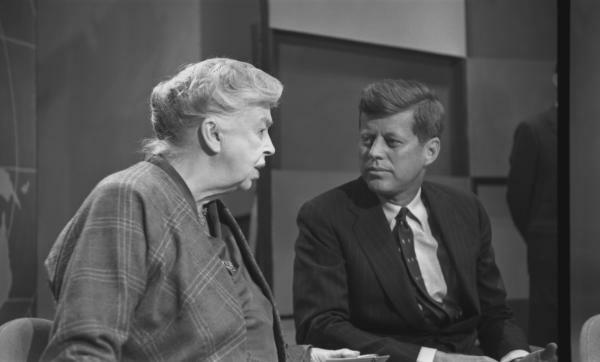 Eleanor Roosevelt speaks with presidential candidate John F. Kennedy in 1960. Franklin Delano Roosevelt delivered his most resonant and famous line during his presidential inauguration speech of 1933: "So, first of all, let me assert my firm belief, that the only thing we have to fear is fear itself." It was resonant because he was being defiant, and optimistic, in the face of the Great Depression — and it was famous because it was broadcast live, to the entire nation, on the relatively new medium of radio. It was filmed, too, and when we get to this moment in the newest Ken Burns nonfiction epic, about halfway through The Roosevelts: An Intimate History, we can see and hear Roosevelt speak. That puts a lot of extra weight on Burns and his collaborators in this documentary miniseries, which launches Sunday on PBS. Since Theodore Roosevelt was born just a few years before the start of the Civil War, this new 14-hour joint biography — of Teddy, his niece, Eleanor, and Teddy's fifth cousin, Franklin — begins on familiar Burns territory. There are lingering, slowly tightening shots of old photos and news clippings, with actors hired to give voice to real-life historical figures. You could say Burns, once again, is up to his old tricks — but they're still great tricks. At the end of Sunday's Part 1, Paul Giamatti, as U.S. Vice President Teddy Roosevelt, remarks on suddenly ascending to the presidency after the assassination of William McKinley. "It is a dreadful thing to come into the presidency this way, but it would be a far worse thing to be morbid about it," he says. "Here is the task and I've got to do it to the best of my ability, and that is all there is about it." That sort of audio role-playing gets trickier when we, the audience, are familiar with the historical voices being impersonated. Yet that obstacle is overcome in spectacular fashion, thanks to some Emmy-worthy vocal acting — and some equally Emmy-worthy scriptwriting. A perfect example of both is in Part 4. It's the summer of 1921, and Franklin Roosevelt, age 39, has just spent a day sailing, swimming and racing with his family — only to retire early because his legs felt weak and funny. It's the very moment when Roosevelt is stricken by infantile paralysis, by polio — and it's captured perfectly in this TV history, because of the talent and passion of all involved. Edward Herrmann, who won an Emmy for his pitch-perfect portrayal of FDR in the made-for-TV movie Eleanor and Franklin way back in 1976, brings the man to life again here — and does so with such authority and accuracy, that his vocal impersonation stands proudly alongside recordings of the real Franklin. Then there's the writing. Longtime Burns collaborator Geoffrey C. Ward, a biographer of Franklin Roosevelt, wrote this entire 14-hour documentary — and also appears on camera occasionally. He emerges as this TV program's secret weapon, because, when recounting the history of these three famous Roosevelt relatives, he's thoroughly invested and empathetic. That's never truer than in the sequence where Franklin goes to bed tired and wakes up unable to use his legs. Ward, like Franklin, is a survivor of polio — and when Ward shows up on camera to describe how Franklin must have felt, it's a searingly raw, honest moment. Coming right after Herrmann's impersonation of Franklin, it's a hauntingly potent one-two punch. The other major players in The Roosevelts: An Intimate History are Meryl Streep and Peter Coyote. Streep, as Eleanor Roosevelt, brings her gifts for accents and acting and uses them both beautifully. This joint biography doesn't shy away from Franklin's infidelities and betrayals, or his wife Eleanor's very independent life — not even at the end of their long and complicated marriage, when Streep reads one of Eleanor's subtly honest remarks after the death of her husband, in the documentary's final chapter. Streep is marvelous. So is Peter Coyote, who has narrated many Burns documentaries with the perfect pace and pitch, and does so again here. Each of these Roosevelts, if studied individually, would be fascinating. But looking at them together like this is a revelation — a sort of storytelling synergy, where the whole ends up being even more valuable than the sum of its parts. The Roosevelts: An Intimate History is biographical binge-watching at its best. In fact, I think it's Burns' best, too. David Bianculli is founder and editor of the website TV Worth Watching, and teaches TV and film history at Rowan University in New Jersey. This is FRESH AIR. This Sunday, PBS launches "The Roosevelts: An Intimate History," the latest documentary series from Ken Burns and company. It's a triple biography of Theodore, Franklin and Eleanor Roosevelt. And it takes 14 hours of TV time stretched over seven consecutive nights. Our TV critic David Bianculli says it's worth the time. And he considers it the best Burns documentary yet. PRESIDENT FRANKLIN DELANO ROOSEVELT: So first of all, let me assert my firm belief that the only thing we have to fear is fear itself. DAVID BIANCULLI, BYLINE: That's Franklin Delano Roosevelt delivering the most resonant and famous line from his presidential inauguration speech of 1933. It was resonant because he was being defiant and optimistic in the face of the Great Depression. And it was famous because it was broadcast live to the entire nation on the relatively new medium of radio. It was filmed, too. And when we get to this moment in the newest Ken Burns nonfiction epic, about halfway through "The Roosevelts: An Intimate History," we both see and hear Franklin speak. That puts a lot of extra weight on Burns and his collaborators this time around. Since Theodore Roosevelt was born just a few years before the start of the Civil War, this new, 14-hour joint biography of Teddy, his niece Eleanor and Teddy's fifth cousin, Franklin, begins on familiar Ken Burns territory. There are lingering, slowly tightening shots of old photos and news clippings, with actors hired to give voice to real-life historical figures. You could say Ken Burns once again is up to his old tricks. But they're still great tricks. At the end of Sunday's Part 1, here's Paul Giamatti as U.S. Vice President Teddy Roosevelt, remarking on suddenly ascending to the presidency after the assassination of William McKinley. PAUL GIAMATTI: (As Theodore Roosevelt) It is a dreadful thing to come into the presidency this way. But it would be a far worse thing to be morbid about it. Here is the task, and I have got to do it to the best of my ability. And that is all there is about it. Theodore Roosevelt. BIANCULLI: That sort of audio role-playing gets trickier when we, the audience, are familiar with the historical voices being impersonated. Yet, that obstacle is overcome here in spectacular fashion, thanks to some Emmy-worthy vocal acting and some equally Emmy-worthy scriptwriting. Here's a perfect example of both, from Part 4. It's the summer of 1921, and Franklin Roosevelt, age 39, has just spent a day sailing, swimming and racing with his family only to retire early because his legs felt weak and funny. It's the very moment when Roosevelt is stricken by infantile paralysis, by polio. And it's captured perfectly in this TV history because of the talent and passion of all involved. Edward Herrmann, who won an Emmy for his pitch-perfect portrayal of FDR in the made-for-TV movie, "Eleanor And Franklin" way back in 1976, brings the man to life again here and does so with such authority and accuracy that his vocal impersonation stands proudly alongside recordings of the real Franklin. Then, there's the writing. Long-time Ken Burns collaborator Geoffrey C. Ward, a biographer of Franklin Roosevelt, wrote this entire 14-hour documentary and also appears on camera occasionally. He emerges as this TV program's secret weapon because when recounting the history of these three famous Roosevelt relatives, he's thoroughly invested and empathic. That's never more true than in the sequence where Franklin goes to bed tired and wakes up unable to use his legs. Ward, like Franklin, is a survivor of polio. And when Ward shows up on camera to describe how Franklin must have felt, it's a searingly raw, honest moment. Coming right after Edward Herrmann's impersonation of Franklin, it's a hauntingly potent one-two punch. Here's Herrmann as Franklin, then historian Ward. EDWARD HERRMANN: (As Franklin Roosevelt) The next morning, when I swung out of bed, my left leg lagged. I tried to persuade myself that the trouble with my leg was muscular, that it would disappear as I used it. But presently, it refused to work - and then the other. By the end of the third day, practically all muscles from the chest down were involved. GEOFFREY C. WARD: It produces terror - unreasoning terror. You just can't believe that the legs that you depended on simply don't work. And I don't know how to convey to people the sense that suddenly, he could not go to the bathroom. He couldn't go for the telephone. He couldn't do anything on his own. And the limbs that, you know, he was a - he was a great dancer. He was a great golfer. He loved to run. None of that would ever happen again. He dreamed about it all his life, but he never could do it. BIANCULLI: The other major players in "The Roosevelts: An Intimate History" are Meryl Streep and Peter Coyote. Streep, as Eleanor Roosevelt, brings her gifts for accents and acting and uses them both beautifully. This joint biography doesn't shy away from Franklin's infidelities and betrayals or his wife Eleanor's very independent life - not even at the end of their long and complicated marriage, when Meryl Streep reads one of Eleanor's subtly honest remarks, after the death of her husband, in this documentary's final chapter. MERYL STREEP: (As Eleanor Roosevelt) All human beings have failings. All human beings have needs and temptations and stresses. Men and women who live together through long years get to know one another's failings. But they also come to know what is worthy of respect and admiration in those they live with and in themselves. If at the end one can say, this man used to the limit the powers that God granted him, he was worthy of love and respect and of the sacrifice many people made in order that he might achieve what he deemed to be his task, then that life has been lived well, and there are no regrets. BIANCULLI: Streep is marvelous - so is Peter Coyote, who has narrated many Ken Burns documentaries with the perfect pace and pitch and does so again here. Each of these Roosevelts, if studied individually, would be fascinating. But looking at them together like this is a revelation, a sort of storytelling synergy where the whole ends up being even more valuable than the sum of its parts. 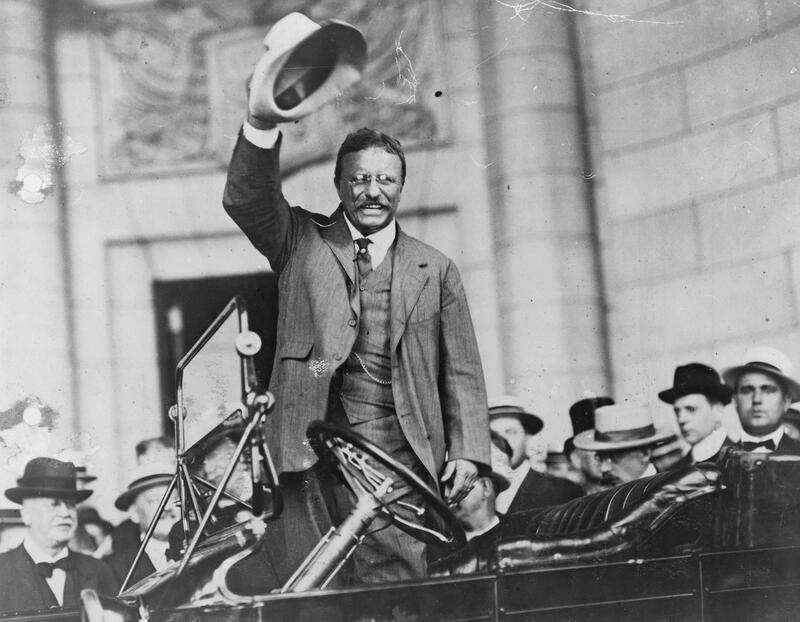 "The Roosevelts: An Intimate History" is biographical binge-watching at its best. In fact, I think it's Ken Burns's best, too. GROSS: David Bianculli is founder and editor of the website TV Worth Watching and teaches TV and film history at Rowan University in New Jersey. If you want to keep up with our program and do it on your own schedule, you can subscribe to our podcast through the podcast app on your mobile device. Transcript provided by NPR, Copyright NPR.